Anna Maria Horner grew up in a house full of her dad's paintings and with a closet full of her mom's handi-work. Beds were warmed by the hand-loomed wool blankets sent by her grandmother from Greece. The busy little bodies of her and her siblings were warmed by the beautiful hand-knits of their grandmother in Indiana. As a kid in the 70's, she passed store-bought Barbie dresses and instead created her own from her mother's fabric scraps. A simple start to a diverse path. In 1995, after graduating with an Honors Fine Arts Degree in Drawing from the University of Tennessee, Anna Maria opened Handmaiden, a clothing and housewares boutique. This retail space served as the home base for Anna Maria's clothing line which she designed and produced, together with her mom. Eventually, the label was offered to the wholesale market, where it sold at several stores across the country. Designing clothing served an interest that she had since childhood. Anna Maria kept her hands in many mediums on a daily basis. Her love of fabrics and patterns also spilled onto the canvas. In the midst of clothing design and production, she stayed active artistically by exhibiting in galleries regularly. Her paintings, both small and large scale, are a part of hundreds of private and commercial collections. There have been varied stops on her path to here, but a common element in all of her work, whether fashion, quilting or fine art, is a passion for the language of color. Continuing to realize her point of view in many disciplines, led to a stream of artistic growth. Somewhere around 2001, her fascination with taking an idea through all the necessary steps from her sketchbook to a store shelf sparked the momentum to create a brand. Anna Maria's fresh perspectives within traditional markets and her vision of being surrounded by the work of her own hands has led her to partnering with more than two dozen manufacturers to design homewares, gift items, textiles, authoring three sewing books, and publishing a continuing collection of sewing and needlework patterns. Her focus has intensified in the craft and creative industry where her heart has always been. Today Anna Maria and her husband, Jeff, make their home on a rambling and not overly maintained two acres of happiness in Nashville. Their seven children range in age from 3 to 24. Together they embrace both the charming and imperfect moments of raising a large family. She is incredibly thankful to be able to seek out her artistic goals in the presence of her family and is inspired by the constant spontaneity and tempo of life. Description: Anna Maria Horner shares how to use machine reverse applique to create this simple but stunning floral block that can be combined very specifically with others, or more sporadically with some solid blocks for a varied look. She also offers tips of scaling the block to suit each quilter’s hopes for their finished design. Because the sewing technique is so straightforward, Anna Maria has plenty of time to work with students one on one for fabric selection process and design ideas. Description: Drawing on her tireless passion for handwork, Anna Maria offers a customized class based on hand quilting, embroidery, and embellishment concepts for the quiltmaker and embroiderer. 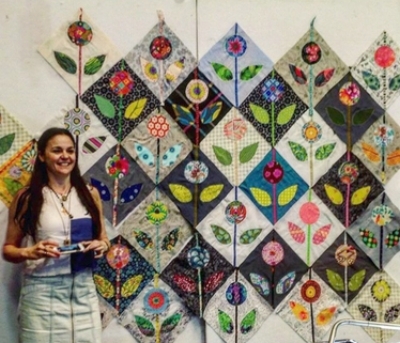 With several diverse examples of her own explorations to share, Anna Maria offers demos on stitch styles and how to look at fabric and materials in a new way, from straightforward instruction on hand quilting to improvisation techniques for applique collages.